Made with Godminster cheese. Gluten free. 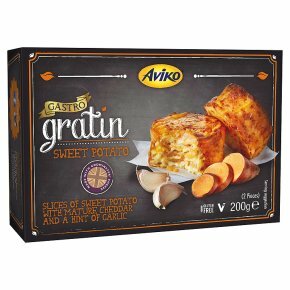 Suitable for vegetarians.Slices of sweet potato with mature cheddar and a hint of garlic These potato gratins have been crafted with love, passion and no small amount of rich, creamy Godminster cheddar. It's the cheese (and a few other clever little flavours) that lend our gratins that bistro-style chef-iness. Enjoy. 3 Steps to Gratin Greatness1. Preheat oven to 200°C/395F.2. Remove gratins from packaging and place on a baking tray lined with baking paper.3. Cook on middle shelf for approximately 25 minutes until golden and gorgeous.Cook from frozen. Cooking appliances vary.These instructions are guidelines only.